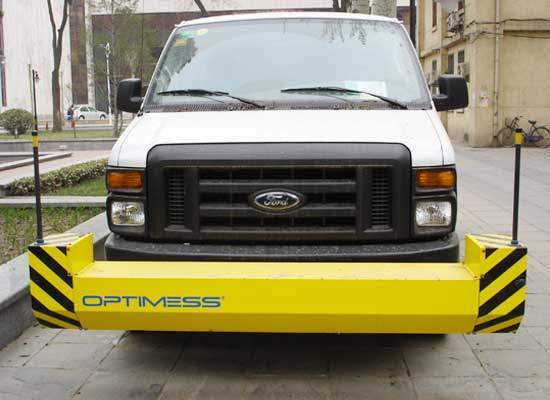 The OPTIMESS RIS measuring system is used for reliable detection of the condition of a given road. The vehicle-mounted laser sensors facilitate contact-free detection of the structure and profile of the road – both in longitudinal and lateral directions. Die Messdaten der Sensoren, Beschleunigungsaufnehmer, GPS sowie Encodersignale werden direkt während der Fahrt miteinander verrechnet und gespeichert. Dank der hohen Messfrequenz der Sensoren kann der Strassenzustand zuverlässig mit einer Geschwindigkeit von über 100 km/h gemessen werden, somit entstehen auch keine Behinderungen für den Verkehr. Die unempfindlichen und robusten Sensoren können sowohl bei nasser Fahrbahn wie auch starker Sonneneinstrahlung eingesetzt werden. The measurement data from the sensors, the accelerometer, the GPS, and the encoder signals are all reconciled and saved live, as the trip progresses. The sensors’ high test frequency enables the condition of the road to be reliably measured at a speed of over 100 kmh ensuring that traffic is not disrupted. The rugged, robust sensors can be employed when the carriageway is wet and in conditions of strong sunlight.